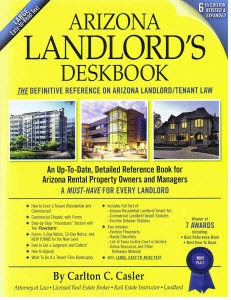 Arizona Landlord Tenant Blog: Lease/Rental Agreement - What MUST, SHOULD and CANNOT be included (residential)? Lease/Rental Agreement - What MUST, SHOULD and CANNOT be included (residential)? provide the tenant with a move-in inspection form when tenancy begins and an out-of-state residential landlord must have an in-state statutory agent. The rental agreement SHOULD: be written; be comprehensive; provide for abandonment; describe the tenant’s maintenance obligations; explain limitations on alterations/modifications; provide for regular inspections; provide for payment of expenses incurred to bring legal action, late fees, notice fees and how partial payments are to be applied; include a liquidated damages provision, a jury waiver provision, allow for rental tax increases and include other provisions. The rental agreement CANNOT: require the tenant to waive his/her rights, include any provision contrary to the Act, agree to pay attorney’s fees (with an exception), agree to limit the landlord’s liability, and/or require a security deposit greater than one and one-half month’s rent.